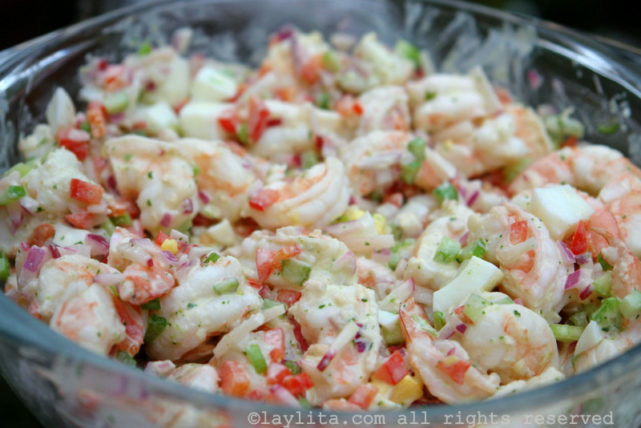 This delicious and easy to make shrimp salad is made with boiled or steamed shrimp, red onion, radish, bell pepper, egg, celery and cilantro mayonnaise. 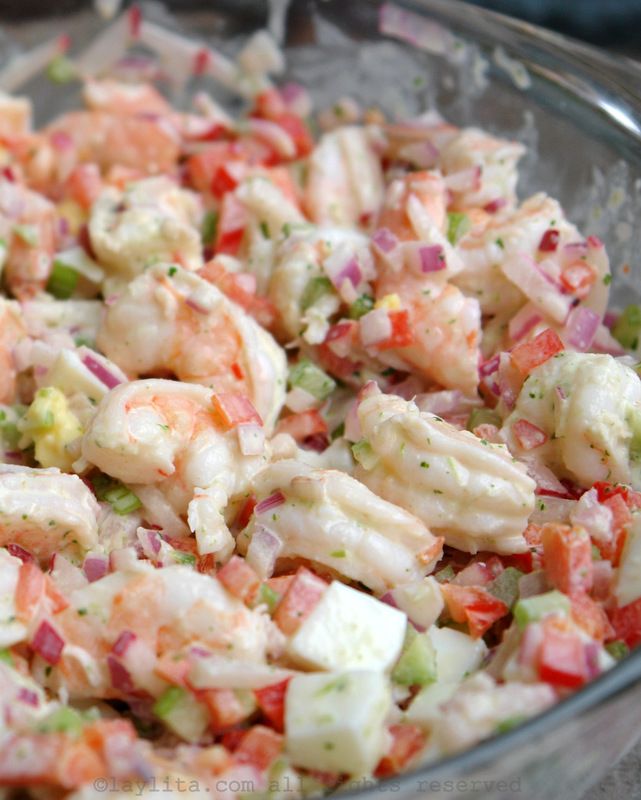 This shrimp salad is served cold, and can be served immediately after preparing it, or made ahead of time and refrigerated until ready to serve. The flavor improves if it’s refrigerated for a bit before serving. 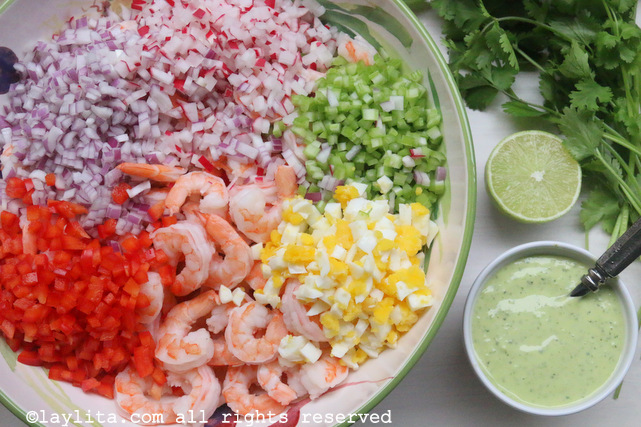 The cilantro mayonnaise used in this shrimp salad can be made from scratch (highly recommend it if you don’t have issues with raw eggs), or for a semi homemade version, you can blend or mix store-bought mayo with cilantro and garlic. The salad can be served simply as is, or just on top of lettuce leaves. However, it can also be used to fill avocados or tomatoes. 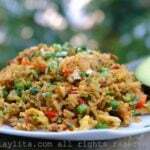 It can be served on top of green plantain chips (patacones or tostones). You can also easily modify and add additional vegetables if you like; some options include diced cucumber, cooked carrots, peas, etc. For a more filling salad you can also mix it with cooked pastas for a pasta shrimp salad variation. And of course, if are a fan of spiciness, go ahead and add some diced jalapeños/serranos. Easy shrimp salad recipe made with cooked shrimp, red onion, radish, bell pepper, egg, celery, and cilantro mayonnaise. 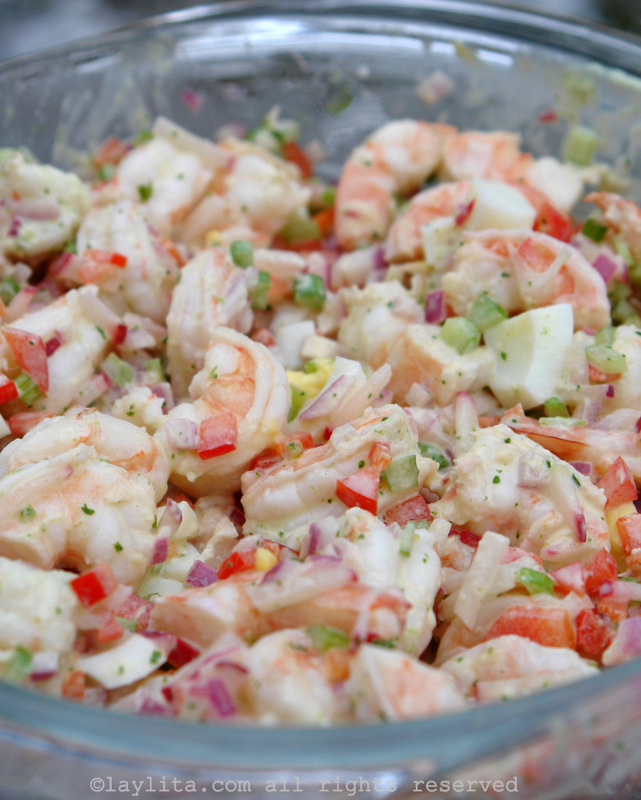 In a salad bowl, combine the cooked shrimp (whole or cut in half) with the diced red onions, radishes, bell pepper, celery, eggs, lime juice, cilantro mayonnaise, and salt to taste. For a spicy touch add diced jalapenos or hot peppers to taste. This shrimp salad can be served immediately, but for best results I recommend letting it sit in the fridge for an hour or two before serving. Can you use a substitute for mayo? Hi Mary – You can, however since the mayo has cilantro, garlic and lime which give additional flavor I recommend using a dressing that has those flavors. I loved this but without the bell pepper. Only because i dont care for raw bell pepper. How long will this keep in the fridge if you don’t eat it all at once? A couple of days, I wouldn’t recommend keeping it longer since it uses both shrimp and a homemade aioli/mayonnaise. Just made this salad and left it in the fridge I come back an hour later and it’s gone. My husband said it was great lunch. I haven’t even tried it. So I guess it’s good. 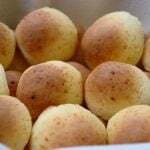 Thank you again for another great recipe . Wonderful brunch, lunch or dinner salad! It reminded me again that I like shrimp! I am thinking of using it as an appetizer in cherry tomatoes during the Holiday Season!